We have a wonderful listing that is truly a great bargain in Lafayette Oaks, so today's post will update the housing report for this popular NE Tallahassee neighborhood. Tallahassee's first gated community offers large homes, mature landscaping, and excellent access to Tallahassee via Mahan Drive East. The past few years have seen great changes for Mahan Drive, and I expect the better access will soon have a very positive impact on home values in Lafayette Oaks. There are a wide array of opportunities for home buyers as most homes were built forty years ago. This means they are in a varied array of updating, so the prudent buyer should understand the value structure in order to purchase safely. In this article, we will look at long term home price trends, value trends, and size trends of homes sold in Lafayette Oaks, as well as show current listings in the Tallahassee MLS and all closed home sales going back to 1991. It is important to note that the narrative contained below is for sales through December for all previous years, but through mid October in 2015. The graphs and the closed sales table will be continuously updated into the future (meaning bookmark this page if you always want to know the current status of homes in the Lafayette Oaks). Average home prices have fallen 4% in 2015 versus 2014, and current prices are now 29% below the peak recorded in 2008. With the road work on Mahan being completed this year, we suspect this trend to reverse. The average recorded sales price has been $255,700 for Lafayette Oaks in 2015. Home sales activity last year was hot, so the fact that fewer sales are happening this year is not really a big surprise. The current 8 closed home sales are likely all we will see in 2015. 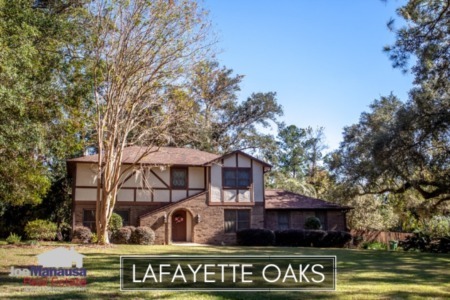 Average home values in Lafayette Oaks have fallen 12% in 2015 when compared to 2014, mostly due to the fact that larger homes are selling and also two very low-valued sales occurred several months ago. Smart buyers understand that sub $100 per square foot values will not be the norm in the future. In 2015, the average value of a home sold in Lafayette Oaks has been $96 per square foot. This is down about 26% from the market high set back in 2006 and up 10% over the bottom of the market. There are currently 5 homes for sale in Lafayette Oaks, priced from $90 per square foot to as high as $126 per square foot (including this best-buy). The average home size sold in Lafayette Oaks typically falls in a range of 2,300 to 2,700 square feet, and buyers this year are selecting homes at the very top of this range. The 8 home sales in 2015 have averaged 2,666 square feet. 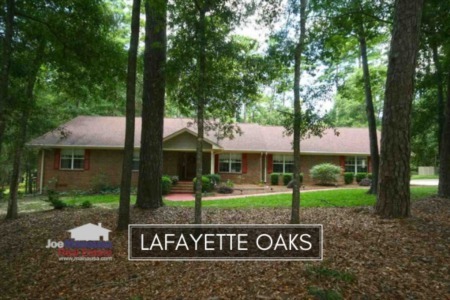 The following map and list of homes are the most recent listings in Lafayette Oaks. This list is updated every 15 minutes, so you can be assured that this page will always bring you the most up-to-date listings and sales that can be found for Lafayette Oaks (bookmark this page if this is an area that you want to track). I hope you enjoyed our October 2015 update on home sales in Lafayette Oaks, please feel free to drop me a note if you have questions not covered in this report. What Is The Median Home In Tallahassee?